American engineer mission specialist astronaut 1984-1993. Status: Inactive; Active 1984-1993. Born: 1951-11-18. Spaceflights: 2 . Total time in space: 10.39 days. Birth Place: Valparaiso, Indiana. PERSONAL DATA: Born November 18, 1951, in Valparaiso, Indiana. Married to the former Lynne A. Anderson of River Grove, Illinois. They have two daughters. Recreational interests include fishing, hiking, jogging, all sports, and chess. His parents, Mr. and Mrs. Richard S. Brown, reside in Valparaiso, Indiana. Her mother, Mrs. Charles E. Anderson, resides in River Grove, Illinois. EDUCATION: Graduated from Valparaiso High School, Valparaiso, Indiana in 1969; received a bachelor of science degree in aeronautical and astronautical engineering from Purdue University in 1973, and a master of science degree in astronautical engineering from the Air Force Institute of Technology in 1980. SPECIAL HONORS: NASA Space Flight Medal. Distinguished Graduate from Air Force ROTC, Aerospace Defense Command "We Point With Pride" Award, Air Force Command Pilot, Senior Space Badge, Defense Superior Service Medal, two Air Force Commendation Medals, Air Force Outstanding Unit Award, Combat Readiness Medal, National Defense Medal, and the Small Arms Expert Marksmanship Ribbon. EXPERIENCE: Brown received his pilot wings at Laughlin Air Force Base, Texas, in 1974. He was then assigned to the 87th Fighter Interceptor Squadron at K.I. Sawyer Air Force Base, Michigan, where he flew both T-33 and F-106 aircraft. In 1979 Brown was transferred to the Air Force Institute of Technology at Wright-Patterson Air Force Base, Ohio, and received his master of science degree in astronautical engineering in 1980. NASA EXPERIENCE: Brown has been employed at the Lyndon B. Johnson Space Center since 1980. Assigned as an engineer in the Flight Activities Section, he participated in the development of contingency procedures for use aboard the Shuttle and served as an attitude and pointing officer. Brown supported STS flights 2, 3, 4, 6, 8 and 41-C in the Flight Activity Officer/Staff Support Room of the Mission Control Center. 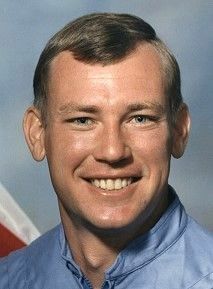 Selected by NASA in May 1984, Brown became an astronaut in June 1985, and qualified for assignment as a mission specialist on future Space Shuttle flight crews. In December 1985, he was assigned to the crew of a Department of Defense mission which was subsequently canceled due to the Challenger accident. During 1986 and 1987, he served as an astronaut member of the solid rocket booster redesign team. In February 1988 Brown was assigned to a new flight crew. He flew on STS-28 (August 8-13, 1989), following which he served as astronaut member on the Space Station Freedom Program. He next flew on STS-48 (September 12-18, 1991). With the completion of his second mission, Brown has logged over 249 hours in space. On his first space flight, Brown served as a mission specialist on the crew of STS-28. The Orbiter Columbia launched from Kennedy Space Center, Florida, on August 8, 1989. The mission carried Department of Defense payloads and a number of secondary payloads. After 80 orbits of the Earth, this five-day mission concluded with a dry lakebed landing on Runway 17 at Edwards Air Force Base, California on August 13, 1989. Brown next flew on the crew of STS-48 aboard the Orbiter Discovery which launched from Kennedy Space Center, Florida, on September 12, 1991. This was a five-day mission during which the crew deployed the Upper Atmosphere Research Satellite (UARS) which is designed to provide scientists with their first complete data set on the upper atmosphere's chemistry, winds and energy inputs. The crew also conducted numerous secondary experiments ranging from growing protein crystals to studying how fluids and structures react in weightlessness. The mission was accomplished in 81 orbits of the Earth and concluded with a landing at Edwards Air Force Base, California, on September 18, 1991. Brown will leave NASA in July 1993 and will retire from the U.S. Air Force to head up the Space Division office of General Research Corporation in Dayton, Ohio. Mr. Brown has enjoyed a distinguished career as an Air Force fighter pilot, engineer, NASA astronaut, NASA manager, and corporate manager. His unique combination of operational and technical experience has made him an invaluable asset to the Air Force, NASA, GRC International, Inc, and AT&T. This was clearly demonstrated during two highly successful space shuttle missions, as a member of the Challenger Accident Investigation Team, as a member of the Solid Rocket Motor Redesign Team, as the senior astronaut on the Space Station Program, as a GRC International, Inc., Program Manager, as an AT&T District Manager, and as a CSC Vice President and General Manager. Mr. Brown was assigned to NASA at the Johnson Space Center (JSC) in Houston by the Air Force due to his extensive experience as a fighter pilot and engineer in 1980. His responsibilities included the development of shuttle emergency procedures, training astronauts, and working in the Mission Control Center. While en route to a new military assignment overseas, Mr. Brown was called back to NASA, but this time as an astronaut. In the years that followed, he served as a crewmember on two space shuttle flights and performed numerous additional duties. He also worked on the Space Station Program beginning in 1989 up until his retirement in the summer of 1993. His last space station position was as the Deputy Chief of the Flight Crew Operations Directorate Space Station Office. In this capacity he was responsible for representing the Astronaut Office in all phases of station design and development. This included the establishment of program requirements related to redundancy, fault tolerance, crew and vehicle risk management, and training. Mr. Brown is unique in that he has personally participated in all of the aspects of program design, development, management, and operations. Since joining GRCI in September of 1993, as the Director of Space Operations, Mr. Brown has held the following positions: Director of the Program Analysis Group, Director of Aerospace Programs, Acting Director of East Coast Operations, Corporate Marketing and Business Development staff, Director of Wire Integrity Programs, and with AT&T as District Manager, Air & Space Programs Development. Mr. Brown's current position is with CSC as the VP and GM of the Aerospace unit of the CSC Federal Sector Defense Group. Duties have included program management, project management, group management, administration, business development, and congressional liaison. 2003-Present Vice President and General Manager, CSC Federal Sector-Defense Group, Aerospace Business Unit. Mr. Brown is the overall manager of the CSC Aerospace Business Unit responsible for operations, business development, P&L. This $100M business unit includes information technology, logistics support, space systems, program control, and intelligence support. 2002-2003 District Manager, Air & Space Programs Development, AT&T Government Solutions, Inc. Member of the Air Force and NASA Account Teams responsible for the development and execution of a business development plan for the Air Force and NASA. Duties include marketing, business development, budget analysis, capabilities assessments, strategic planning, customer visits, and proposal support. While serving on the Corporate Business Development Staff in 1999, Mr. Brown was asked to investigate problems the commercial airlines were having with the aging of their electrical wiring that had resulted in a number of fatal accidents. After investigating the issues involved, Mr. Brown assembled a team of six companies in 2000 to provide the technologies needed by the airlines and military services to dramatically improve the testing used to maintain wiring in aircraft, the storage of the testing data, the analyses of the test data, and laboratory studies to understand the aging phenomenology. The result of these efforts will be a dramatic reduction in the number of in-flight electrical failures, a corresponding reduction in the costs to maintain these aircraft, and a significant improvement in the safety of these same aircraft. As the leader of this team and a recognized leader in this field, Mr. Brown was a regular speaker and presenter at Aging Aircraft Conferences, technical symposia, and in 2001 at the Paris Air Show. This program was sold in its entirety to Honeywell in 2002. His technical and leadership skills have clearly been demonstrated through his performance in this role. 1998-2000 Director of Air Force and NASA Business Development, Corporate Marketing and Business Development, GRC International, Inc.
As a member of the corporate staff, Mr. Brown actively participated in the development of new business opportunities for GRC International. His wide experience base with government and commercial business proved invaluable to GRCI in identifying new areas for technology growth and in developing solutions to customer problems. 1996-1998 Acting Director of East Coast Operations, Decision Technologies Division, GRC International, Inc.
Mr. Brown was promoted to this position in October 1996 and assumed responsibility for this $6.5M per year business involving NASA, the Air Force, commercial, and other government activities. Duties included full budget accounting and management of computer programmers, engineers, technicians, scientists, and administrative personnel located in three different states. Business contacts included senior NASA management, senior military officers, and members of Congress. Under his leadership, GRCI developed the Paths Data System (PDS) for the Space Station and X-38 programs at JSC. This systems integration software was nominated for the NASA Software of the Year award. GRCI also developed a commercial version of PDS (MultiLinx) for other applications. An SBIR application was submitted to the Stennis Space Center to upgrade test stand leak detection to multi-spectral sensors. His team proposed the use of multi-spectral technology for on-orbit leak detection and contamination characterization to the Shuttle, Shuttle/Mir, and Station programs. They has also proposed the use of this technology on free-flying spacecraft to NASA and ESA. Mr. Brown continues to demonstrate the ability to apply new technologies to solve problems. 1995-1996 Director of Aerospace Programs, Decision Technologies Division, GRC International, Inc.
Mr. Brown's assignment to the Aerospace Programs group expanded his management responsibilities to include support to Air Force air and space projects in addition to NASA. This support included software development and services to the Aeronautical Systems Center (ASC), the National Air Intelligence Center (NAIC), and the Defense Intelligence Agency (DIA). Responsibilities included project and group management as well as business development. His duties also included the realignment of personnel in response to NASA budget-cutting activities. In addition to technical support, this group was actively involved in multi-media training, relational databases, automated systems analysis, GPS applications, and multi-spectral science applications. 1994-1995 Director of the Program Analysis Group, Space Division, GRC International, Inc.
Mr. Brown was the manager of the GRCI group responsible for NASW-4470 contract support to NASA HQ and other support to NASA. He served as the Program Manager for NASW-4470 and led the GRCI contractor team for the recompete of this contract. Although GRC won this recompetition, NASA canceled the contract due to budget cutbacks mandated by Congress. Mr. Brown also managed a distributed technical staff located in Dayton, Ohio; Houston, Texas; Vienna, Virginia; and Cocoa Beach, Florida. NASA support on NASW-4470 ranged from the development of landing simulators for astronauts to the review/evaluation of avionics upgrades for the Space Shuttle. Under his leadership, many innovative proposals were presented to NASA including the development of a "Simulation Room" at NASA HQ for demonstrations to senior officials and members of Congress, and the consolidation of all payload development and training in support of Code U. 1993-1994 Director of Space Operations, Space Division, GRC International, Inc.
Mr. Brown retired from the Air Force and NASA during the summer of 1993 and joined GRCI as the Director of Space Operations. Duties included support to NASA through NASW-4470 to NASA HQ, Code M. This contract, on which GRCI was the prime, provided technical support to the NASA Space Station Program, NASA Hubble Space Telescope Mission, the NASA Space Shuttle Program, the Office of Life and Microgravity Sciences and Applications, and NASA HQ. Mr. Brown provided direct technical support and task management. 1992-1993 NASA, Deputy Chief of the Space Station and Exploration Office, Flight Crew Operations Directorate, Johnson Space Center, Houston, Texas. Mr. Brown was assigned this position while still an astronaut due to his extensive experience and engineering skill. He represented the Astronaut Office in all Space Station Program management forums. He participated in all levels of the Space Station Program due to his engineering and flying experience. Activities included basic design, test, and review/evaluation; program requirements definition; system analysis; program verification; and traditional management responsibilities. Mr. Brown managed a technical team that was intimately involved in determining basic space station requirements, developing and reviewing/evaluating designs, and developing operational procedures. Many of the technical and political issues prevalent at that time are still relevant. These include EVA and Robotic assembly; assembly verifications; on-orbit test and checkout; command and control; failure propagation and effects; and emergency procedure development. STS-48 was a space shuttle mission carrying the Upper Atmosphere Research Satellite(UARS) which was designed to study the ozone holes in the atmosphere. Mr. Brown served as an astronaut-mission specialist responsible for the operation of the space shuttle mechanical arm and deployment of UARS. He participated in the design and flight-testing of a digital electronic still camera, structural test of a sub-scale section of the space station truss, and fluid behavior experiment. Astronaut duties, following his second highly successful space flight, included numerous public speeches and presentations plus visits to the White House with the President, Vice President and to Congress. 1990-1991 Head of the Space Station Systems Section, Flight Crew Operations Directorate, Johnson Space Center, Houston, Texas. Mr. Brown was the manager of contractor and civil service engineers responsible for review/evaluation of Space Station Freedom design. Activities included systems design and analysis, fault tolerance analysis, safety, requirements formulation, prototype review/evaluations, procedure development, and computer display creation. The results of these review/evaluations and assessments were used to correct Space Station design deficiencies and to develop operational procedures. Mr. Brown actively participated in NASA management of this program. STS-28 was a secret Department of Defense shuttle mission. Mr. Brown, who flew as an Astronaut-Mission Specialist, was responsible for the primary satellite payload, deployed the satellite on orbit; trained to perform EVAs, and system maintenance and repair. His astronaut duties, following his highly successful first space flight, included numerous public appearances, plus visits to the White House with President Bush, Vice President Quayle, Congress, the Pentagon, and other Government agencies. 1986-1987 Astronaut representative to the Challenger Accident Investigation Team and to the Solid Rocket Motor Redesign Team. Mr. Brown participated as an engineer and astronaut to determine the causes of the Challenger accident and return the shuttle to flight status. Activities involved extensive analysis of manufacturing techniques and procedures as well as the modification and testing of the original design. Duties also included interviews with members of the press and TV media. After this activity concluded, Mr. Brown was assigned to support the first post-accident Shuttle flight as a Systems and Procedures Engineer. 1980-1984 Engineer, Shuttle Flight Operations, Flight Operations Directorate, Johnson Space Center, Houston, Texas. Assigned to space shuttle navigation, procedures development, and malfunction analysis. Worked in Mission Control for the first eleven shuttle flights. Selected as an astronaut. 1973-1979 Air Force Pilot in T-37, T-38, T-33, and F-106 Aircraft. Married: Lynne Brown, Purdue University, Art Education, 1974. BIRTHPLACE AND DATE: Born November 18, 1951, in Valparaiso, Indiana. His parents, Mr. and Mrs. Richard S. Brown, reside in Valparaiso, Indiana. PHYSICAL DESCRIPTION: Blond hair; blue eyes; 6 feet; 180 pounds. EDUCATION: Graduated from Valparaiso High School, Valparaiso, Indiana, in 1969; received a bachelor of science degree in Aeronautical and Astronautical Engineering from Purdue University in 1973, and a master of science degree in Astronautical Engineering from the Air Force Institute of Technology in 1980. MARITAL STATUS: Married to the former Lynn A. Anderson of River Grove, Illinois. Her mother, Mrs. Charles E. Anderson, resides in River Grove, Illinois. CHILDREN: Kristin Elizabeth, October 21, 1981; Karin Alison, May 18, 1986. RECREATIONAL INTERESTS: He enjoys fishing, hiking, jogging, all sports, and chess. SPECIAL HONORS: NASA Space Flight Medal. Distinguished Graduate from Air Force ROTC, Aerospace Defense Command "We Point With Pride" Award, Air Force Command Pilot, Senior Space Badge, Defense Superior Service Medal, two Air Force Commendation Medals, Air Force Outstanding Unit Award, Combat Readiness Medal, National Defense Medal, and the Small Arms Expert Markmanship Ribbon. EXPERIENCE: Brown received his pilot wings at Laughlin Air Force Base, Texas, in 1974. He was then assigned to the 87th Fighter Interceptor Squadron at K. I. Sawyer Air Force Base, Michigan, where he flew both T-33 and F-106 aircraft. In 1979, Brown was transferred to the Air Force Institute of Technology at Wright-Patterson Air Force Base, Ohio, and received his master of science degree in Astronautical Engineering in 1980. NASA EXPERIENCE: Brown has been employed at the Lyndon B. Johnson Space Center since 1980. Assigned as an engineer in the Flight Activities Section, he participated in the development of contingency procedures for use aboard the shuttle and served as an attitude and pointing officer. Brown supported STS flights 2, 3, 4, 6, 8, and 41-C real-time in the Flight Activity Officer/Staff Support Room of the Mission Control Center. Selected by NASA in May 1984, Brown became an astronaut in June 1985, qualified for assignment as a mission specialist on future Space Shuttle flight crews. In December 1985 he was assigned to the crew of a Department of Defense mission which was subsequently canceled due to the Challenger accident. During 1986 and 1987 he served as an astronaut member of the solid rocket booster redesign team. In February 1988 Brown was assigned to a new flight crew. On his first space flight, (August 8-13, 1989), Brown served as a mission specialist on the crew of STS-28, following which he served as astronaut member on the Space Station Freedom Program. The Orbiter Columbia launched from Kennedy Space Center, Florida, on August 8, 1989. The mission carried Department of Defense payloads and a number of secondary payloads. After 80 orbits of the earth, this five-day mission concluded with a dry lakebed landing on Runway 17 at Edwards Air Force Base, California, on August 13, 1989. More recently, Brown was a crew member on STS-48 aboard the Orbiter Discovery which launched from Kennedy Space Center, Florida on September 12, 1991. This was a five-day mission during which the crew deployed the Upper Atmospheric Research Satellite (UARS) which is designed to provide scientists with their first complete data set on the upper atmosphere's chemistry, winds and energy inputs. The crew also conducted numerous secondary experiments ranging from growing protein crystals, to studying how fluid structures react in weightlessness. Mission duration was 81 orbits and concluded with a landing at Edwards Air Force Base, California on September 18, 1991. With the completion of his second mission, Brown has logged over 249 hours in space. Family: Astronaut. Country: USA. Flights: STS-61-N, STS-28, STS-48. Projects: STS. Agency: USAF. Bibliography: 12, 586, 5212. 1951 November 18 - . Birth of Mark Neil Brown - . Nation: USA. Related Persons: Brown, Mark. American engineer mission specialist astronaut 1984-1993. 2 spaceflights, 10.4 days in space. Flew to orbit on STS-28 (1989), STS-48..
STS-28 - . Call Sign: Columbia. Crew: Adamson, Brown, Mark, Leestma, Richards, Shaw. Payload: Columbia F08 / DoD. Mass: 115,900 kg (255,500 lb). Nation: USA. Related Persons: Adamson, Brown, Mark, Leestma, Richards, Shaw. Agency: NASA Houston. Program: STS. Class: Manned. Type: Manned spaceplane. Flight: STS-28. Spacecraft Bus: Shuttle. Spacecraft: Columbia. Duration: 5.04 days. Decay Date: 1989-08-13 . USAF Sat Cat: 20164 . COSPAR: 1989-061A. Apogee: 306 km (190 mi). Perigee: 289 km (179 mi). Inclination: 57.00 deg. Period: 90.50 min. Manned five crew. Deployed 2 classified satellites. Landed at: Runway 17 dry lake bed at Edwards Air Force Base, . Landing Speed: 287 kph. Touchdown miss distance: 1,618.00 m. Landing Rollout: 1,833.00 m. Payloads: DoD Mission. 1989 August 13 - . Landing of STS-28 - . Return Crew: Adamson, Brown, Mark, Leestma, Richards, Shaw. Nation: USA. Related Persons: Adamson, Brown, Mark, Leestma, Richards, Shaw. Program: STS. Flight: STS-28. STS-28 landed at 13:43 GMT. .